I may have been silent here on Written Inc. these last few months, but I was out there almost every day with a camera. And as has long been my habit - or obsession, I'm not entirely sure which - I took many weird photos along the way. 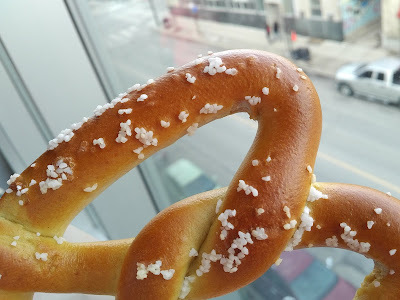 Like this pretzel at a London Lightning game at Budweiser Gardens. It was the last one they had, and for reasons I still do not understand I felt compelled to remember how it looked before I brought it back to our seat. Yes, it had too much salt on it. No, I didn't feel guilty. Some days, you just have to enjoy the moment. And speaking of moments, this photo kicks off this week's Thematic Photographic theme, Junk Food. What's Thematic? Only the most fun you can have with a camera and an Internet connection this side of Kalamazoo, Michigan. Thematic is our weekly photographic sharing and learning activity. Read on for instructions. Or head here for background. Oh, and the good guys won the game. Must have been a lucky pretzel. Your turn: Every Monday, I share a theme (this week's...Junk Food.) Then you take a pic and share it online somewhere (blog, Facebook, Instagram, wherever) and leave a comment here telling people where to find it. Visit other participants to share the photographic joy. Repeat as often as you wish throughout the week. Use the #ThematicPhotographic hashtag and don't be shy. The only rule? There are no rules. Just enjoy. I love fresh baked pretzels! Hello, this is wonderful! I just saw Bob's post and I too will put something together! So excited to play along again. Hello Carmi, I told you I'd be back and here is my Junk Food post! Bon appetit!